For years, people have been searching for the most effective, long-lasting method for removing unwanted hair. When it comes to temporary hair removal procedures, body waxing is a popular choice for many reasons. In today’s post, we’ll review four benefits that are often experienced by those who have this efficient procedure performed, as well as where you can receive spa-quality hair removal services in the Sioux Falls area. For four years running, Radiance Day Spa has been voted your Local Best spa, and we are proud to offer a variety of spa services including natural hair removal treatments. Read on to learn more about the benefits of our body waxing services and then call 605-385-0065 to schedule your appointment today! One of the reasons clients opt for permanent hair removal procedures is because they completely diminish hair growth. While the results are faster with laser hair removal, similar diminished hair growth can be experienced by clients who prefer temporary hair removal if they commit to regular body waxing sessions. Over time, regular waxing will cause hair to become finer and softer, and could potentially even lead hair growth completely stopping. When compared to other forms of temporary hair removal, waxing is far less damaging to your skin. Depilatory creams contain chemicals that are harsh enough to break down the keratin structure of your hair, essentially dissolving the base of your hair. Not only do they smell horrible, these chemicals can also cause skin irritation and pigmentation issues to occur. Because of the knicks and cuts that often occur, shaving frequently can also damage your skin. Removing dead skin cells is an important skin care routine that uncovers fresh, new cells. This not only leaves your skin looking radiant and healthy, but it allows your beauty products to be absorbed more easily. Exfoliation is a natural part of the waxing process — when the warm wax cools on the skin and is subsequently removed quickly, both unwanted hair and dead skin cells are removed simultaneously, leaving smooth, soft skin. Upon receiving their first body waxing treatment, many clients want to know how long they can expect the results to last. While hair will grow back more quickly after waxing than it would with permanent hair removal procedures, it grows back much slower than it would with shaving. This is because waxing removes the hair at the root. Results may vary from client to client, but many experience anywhere from three to eight weeks of smooth, hair-free skin. Are you ready to experience the multiple benefits of body waxing for yourself? 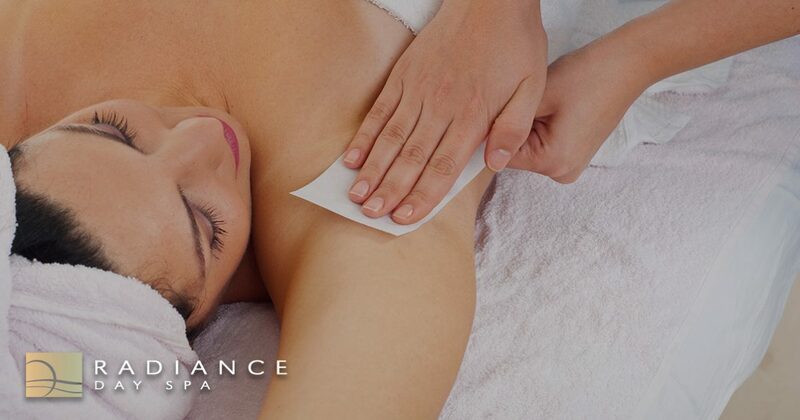 The talented aestheticians at Radiance Day Spa would love to help you achieve the smooth, hair-free skin you’ve been dreaming of, and we are more than happy to answer any questions you have about our natural hair removal services. Contact us today to schedule your appointment. We look forward to meeting you!